We would like to say a big thank you to all those we met up at the Wild About Aden event this week. 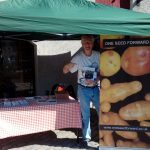 It was great to be able to hand out a lot of free spring onion seeds to get people involved in growing their own – and fun chasing the leaflets when the gusts of wind blew them away. An extra big thanks to all of you who brought back some of your crop to us. A small selection of it is in the photos below, with the Jones’s huge Caras impressing us all. 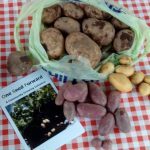 We donated the potatoes to Banff Day Services, a community based service meeting the needs of adults with learning difficulties living in the community after leaving hospital or full time education.